WE are at last reaping the benefits of the golden era of athleisure. Not only is there a multitude of choice for plush designer threads that can take our gym fashion game to new heights, but we can easily pull them off (figuratively!) at casual settings such as weekend powwows or brunches with business associates. Check out the latest that these fashion houses have to offer. Coach’s Rexy sweats are perfect for those seeking an edge on the style game. A clean, tapered cotton affair is gussied up considerably with twill taping (herringbone woven cloth). This tape bears the adorkable silhouette of beloved mascot Rexy. It’s also got tidy drawstring tips, while zip pockets make it easy to stow away a credit card or phone without fear of dropping it on your runs or reps.
Alessandro Michele’s blessed us with what might be Gucci’s most comfortable – and practical – product ever. 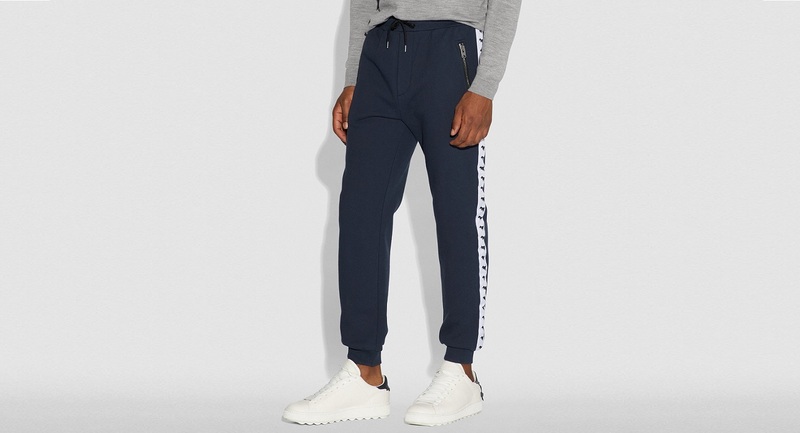 These simple, tapered sweatpants are knit loopback cotton style; the inside face is made up of sweat-absorbing loops that are also immensely comfy. To preserve a clean, effortless look, the pockets are welt rather than stitched on, and the brand’s opted for simple lettering down the left leg. It’s a yes from us. For those still obssessed with two-tone or panel-heavy get-ups, Alexander McQueen’s oversized pockets joggers will hit the spot. Pair with a loose fitting hoodie or sweatshirt for maximum effect. Navy panels sit atop dark charcoal atop comfy cotton. The huge pockets are fully functional of course, but you probably want to make use of the rear zip pocket for any serious exercise. All right, now you’re pushing it. No one’s actually going to believe you hit the threadmill or benched any serious amount in these full calfskin joggers. No, these sweats were made for strutting. The unmistakably BV pants come with slit pockets on the sides, but comes with one patch pocket on the rear so you can hide your belongings away while taking that inevitable #ootd. Throw formality to the winds with a number from sensational Australian fashion Label Song for the Mute. Everything about the this breezy, baggy and light pair of track pants screams that it was made for comfort, down to the satin cotton and dropped crotch. The perfect bottom half to complete your street vibe.